We were having some friends over for a casual evening and some dinner. 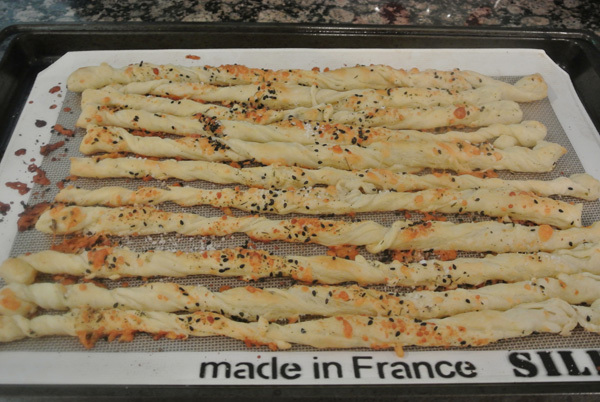 I planned to make several salads, a chicken casserole, rice and wanted to try a recipe for bread sticks that has been floating around Pinterest lately. 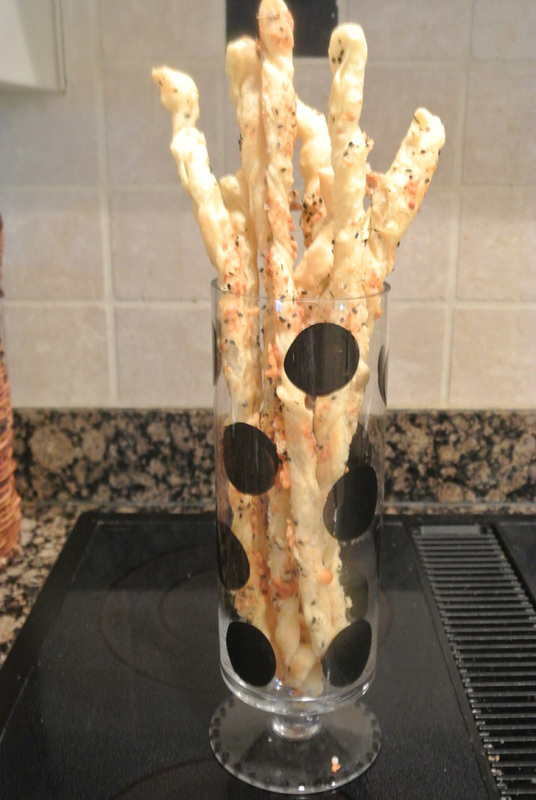 The bread sticks caught my eye because they are LONG and look so cool served vertically in a glass. I HAD to do that! 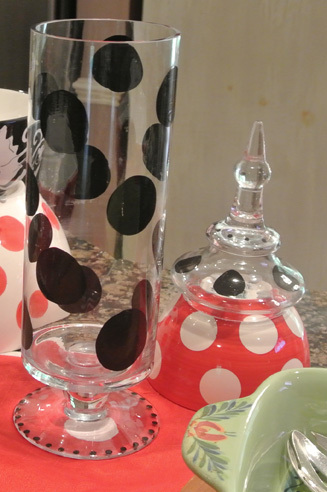 Looking through my things, I came upon a black polka dot apothecary jar which I have used for pasta, candy, cotton balls…Perfect! 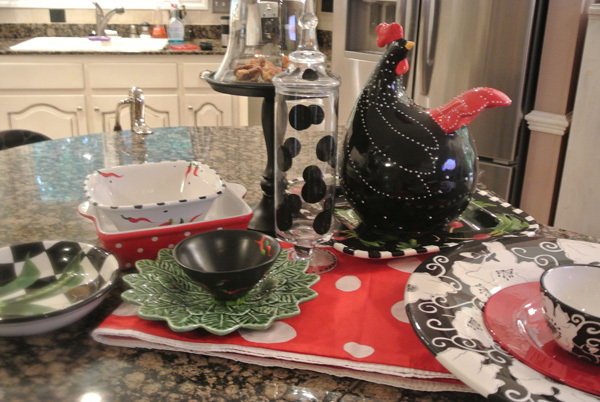 I remembered my red polka dot Christmas table runner and got out my red polka dot casserole and a large black and white bowl which would be perfect for one of the salads. 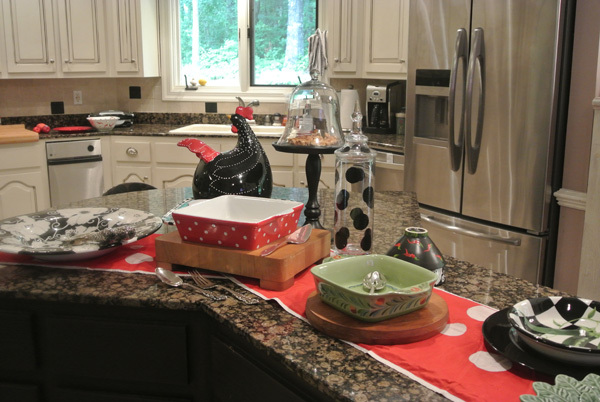 I began to set up the buffet, starting from right and moving down the island towards the left and then with full plates the guests can just head on into the dining room. I put some cutting boards out to serve as trivets for the hot dishes and just had fun stacking some bowls for decorative touches. The small cake dome held some chocolate cashew bars [see August 9 post] that guests could help themselves to after dinner. Everything was all set so I decided to get started on the breadsticks, I couldn’t wait to put them in that polka dot jar! 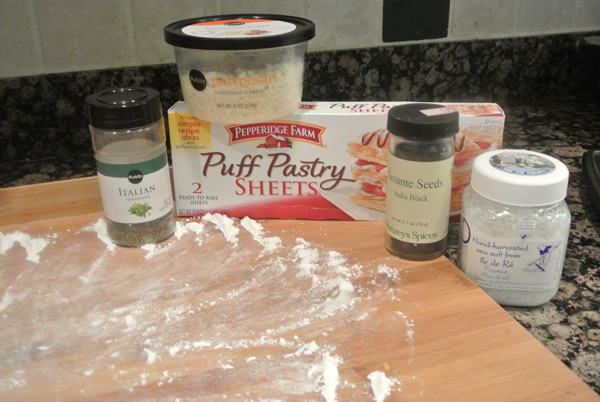 Shoot, why not just throw the stuff on the cutting board, lay the dough on top, sprinkle some more stuff on the dough and cut it. DONE. Which is what I did and it worked out quite well! 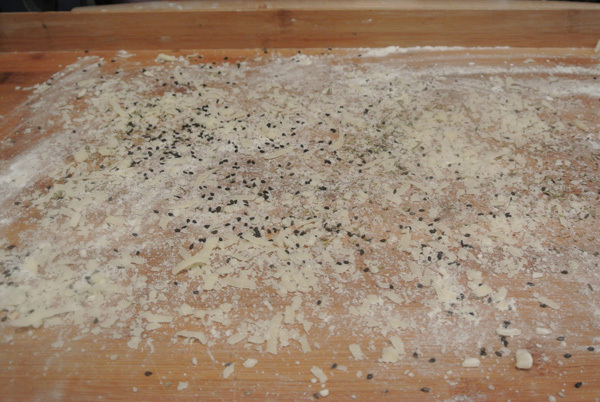 After I spread the flour around the board I sprinkled Parmesan cheese, dried Italian seasoning, black sesame seeds and sea salt evenly over the floured area. Then I topped this with a thawed puff pastry sheet. 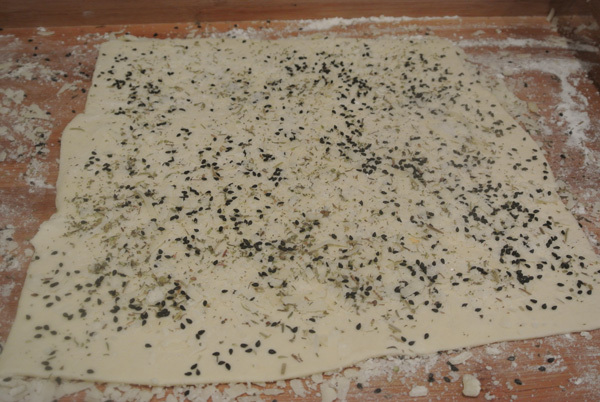 Then I repeated the sprinkling process on the top of the dough and very gently rolled the dough to help the seasonings adhere, but not hard enough for the dough to be hard to remove from the board. Now cut this into about 12 strips, using a knife, pizza wheel or whatever you have. and then they are ready to bake in a 400 degree oven for 10-12 minutes until golden brown. Flour the prep area on cutting board or work surface. 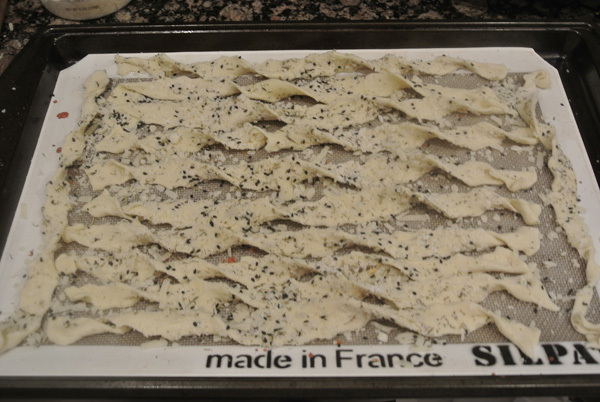 Sprinkle floured surface liberally and evenly with Parmesan, herbs, salt and sesame seeds. Lay one sheet of dough on top of cheese mixture. Repeat sprinkling process on top side of dough. 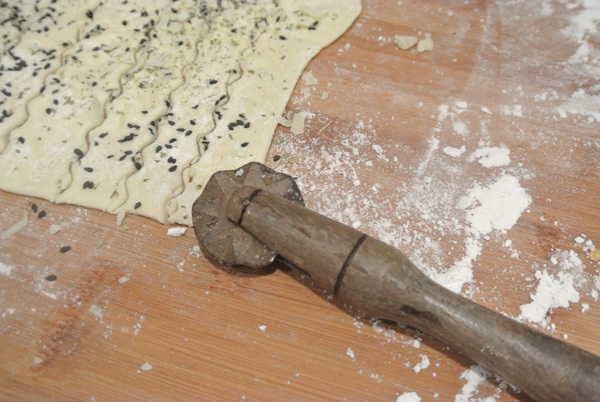 With a rolling pin gently press seasonings into dough, being careful not to use to much pressure or the dough will stick. Cut dough into 12 strips. 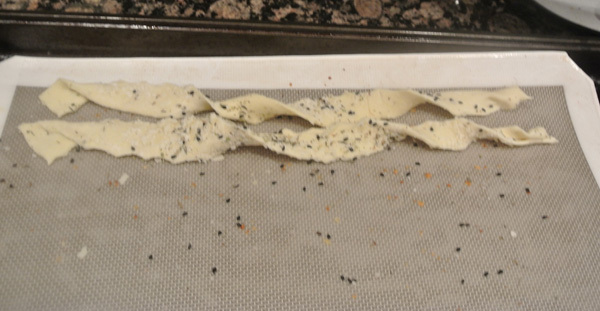 Remove strips to a baking pan lined with parchment or a silpat, gently twisting dough strips. Bake for 10-12 minutes. Cool. 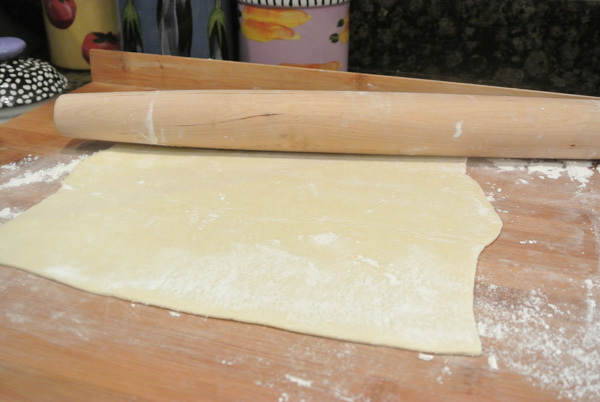 Repeat with 2nd pastry sheet or freeze it for another time. Each sheet makes 12 sticks. Serve upright in cute vase, glass or jar. NOTE: Store these in a sealed container and reheat in a 400 oven for 5-10 and they will taste just baked! I’d like to skip dinner and eat your entire jar of puff pastry sticks 🙂 Genius to add your seasonings and parm to the board! 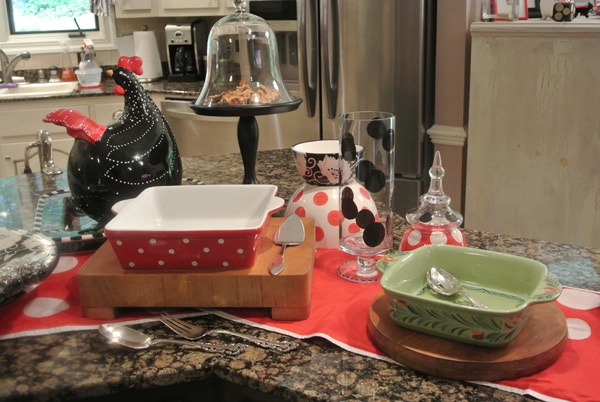 Love your polka dot collection, especially that cute rooster!